The NOKIA is known for connecting people with its great features and stylish looks. The NOKIA N8 is another phone of NOKIA N SERIES and the phone is capturing the whole mobile phone market with its stylish looks and great features introduced into it. 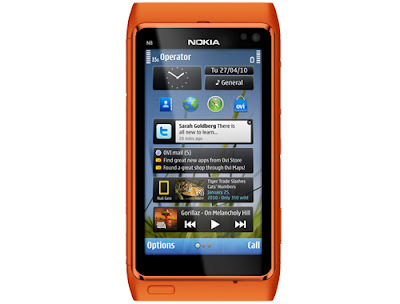 The Nokia N8 is featuring the symbian operating system which is not available in any other nokia phone. The phone has a capacitive touch and a weight of 135g.The phone is available in silver white, dark grey, orange, blue and green colour.N8 has a capacitive touch screen of 3.5 inch and is OLED type. The N8 is also a mini PC as it has a 680 MHz processor, 256 MB RAM and 16 GB internal memory. Also a memory card slot for expanding the memory up to 32 GB is also given. The battery type of this mobile phone is BL-4D is Li-Ion type and of 1200mah power. The phone works both with GSM and WCDMA.The maximum talk time available with GSM is 720 min and that with WCDMA is 350 min. 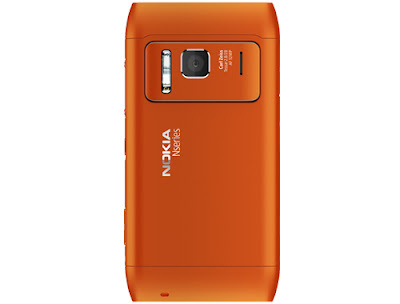 The most interesting and new feature of the NOKIA N8 is its 12MP camera. The camera gives a real image of the person even in dark conditions as it has a xenon flash and auto focus. There is another VGA camera available for making video calls. Navigation feature is also available in N8 as it has GPS, AGPS, WI-FI positioning and electronic compass. The phone makes browsing the internet very easy. It supports PROTOCOLS LIKE http v1.1 and WAP and also it has RSS reader. The touch screen of the phone is very smooth and is very user friendly. As there are two cameras, the main camera captures video in 720p and the secondary camera is 1.3mp for video calls. The video features of the phone supports YOU TUBE browsing and streaming, web tv,MPEG-4,support for xvid/divx video format, video call and video sharing support. The phone has a photo editor and a face recognition software.Yahoo, email, gmail; hotmail can be easily used in the phone. The phone also works with sensors like oriental sensor, proximity sensor, digital compass and ambient light detector.N8 supports GPRS/EDGE, WLAN, and TCP/IP for data transfer.Sms, mms, email, pushmail, IM are also available in the phone. The infrared port is not provided in the phone but a USB port is provided. The phone is available in the market with a price range of RS.23, 000 TO 25,000.The phone is full of every feature required by a user.